Pulled up the matured lettuce and scallions I had under the grow lights and transplanted the new seedlings. These new plants I started from seeds indoor were growing surprising well under the grow lights. Well not all. Tried 2 different varieties of arugula and neither did well. Nor did the mache. Shanghai bok choy was the happiest even though overcrowded. 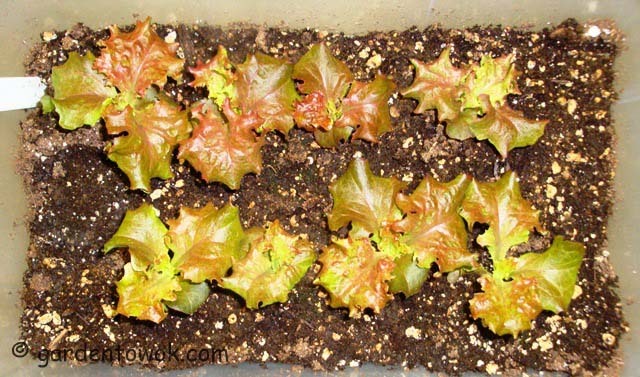 Leaf lettuce looked healthy too. Not sure about the spinach and will never find out as I have to terminate my experiment. Also I will not be posting for a few weeks. The roof above my kitchen developed leaks which damaged my kitchen ceiling and walls. There will be major disruptions in the days ahead. I will not have the time nor the energy nor the frame of mind to tend to those plants so decided best to end the experiment. Kitchen cannot be repaired until the roof is fixed and the roof cannot be repaired until the over a foot of accumulated snow and ice on it melt away. When will this be? All depends on the weather. Was warm over the weekend which melted away some of the snow but we are back in the ice box this week and more snow may be on the way as well. The good news is my roof did not cave in from the weight of the snow and ice like some buildings in the news (wonder how many did not make it into the news). In the meantime, I am busy stocking my stand alone freezer with prepared meals, then it is removing everything from the cabinets and finding storage space for them. A good opportunity to get rid of some of the “junk” I have accumulated over the years. All upper cabinets have to come down and some of the lower cabinets also. Not knowing the extent of the damage is stressing me out and on top of all that my fridge is sounding like it is ready to go any minute. I thought shopping for appliance would cheer me up a bit (so off to the store I went) instead the activity stressed me out more. So many choices and processing all the information about each appliance was just too overwhelming top that with worrying about making the wrong choice. Insurance adjuster came to assess the damage but said he has to return when the roof is free of snow. I am hoping that as soon as the adjuster returns to inspect the roof and the contractor gets to work everything will go smoothly and as planned. Also hoping for dry weather when the roof job starts. Of course after the job is completed the kitchen will need to be put back to order. Not to mention the dusting and cleaning of the entire house. This is a chore I am so not looking forward to (a chore that will need to be repeated a few times as the dust will take its own sweet time to settle over a period of time). Wish me luck. See you in a few weeks. 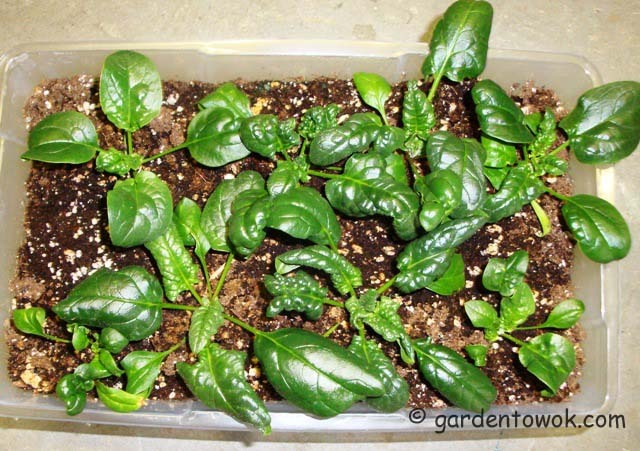 This entry was posted in Gardening, Harvest Monday, Vegetables and tagged container garden, grow light, leaf lettuce, Shanghai bok choy, spinach. Bookmark the permalink. Those plants look so good but I’d be just like you – other things take priority. Good luck! Oh dear Norma, I’m so very sorry to hear of your issues, these thing are indeed very stressful at the best of times; your kids are always very good about stepping up, I hope this time is no different. There are a lot of choices for appliances, I would suggest you make a list of what features you must have and start from there. Taking budget into consideration the selection should be more manageable for sure. Let me know if I can help. I’m excited for when your renos are completed and you can return to your kitchen with renewed energy. Fortunately all of our snow melted off our roof, with the exception of the flat roof over the garage, but it’s considerably less with all the rain we’ve had. I just hope my garlic survived; I can hardly wait to check on it at the cottage too. Norma, sorry to hear about your kitchen leak situation…try not to worry too much…I’m sure everything will work out well. Just take a day at a time, and later, you’ll have a nice kitchen including a new refrigerator:) I’m amazed what you grow under a grow light too! I hope things get better for you soon. Hopefully our weather will turn to spring soon so your roof can melt out. I’d be a mess with the roof leaking into my kitchen. Norma, I’m sorry for the mess! Good luck, we will miss hearing from you for a few weeks! So sorry to hear about your roof and all that entails. I totally understand that stressed out feeling and the woe of facing the workmen and the dust. Hang in there, and hopefully no further damage will happen, the skies will warm and this will be over with before you know it. 🙂 Your experiments are beautiful. I was thinking of them as I cleared my raised bed garden on Saturday, wishing I had some experiments of my own. Oh Norma! Good luck with the the roof/walls in the kitchen. That is not fun at all. I am so impressed by your ability to focus and prioritize in the face of a challenge. I think you’re going to get through this just fine. Your indoor plants have done very well – so impressive! Well, here’s to warm and dry weather! Hugs to you. So sorry to hear all of this. Your plants look like they were doing great, too. What a nightmare. Good luck Norma. I hope your kitchen returns better than ever. Sorry to hear about the damages… Good luck with the renovations! Sorry about your kitchen ceiling Norma. I like how those bok choy turned up. Stay safe and I hope you’ll get the repair for your place soon. Your plants are really healthy. Sorry to hear about the damages. Oh Dear this is not good news….can you enlist some help from your dear daughter? I know you will be happy when this winter is over and this project is behind you. Just hang onto the thought of how beautiful it will be when you are done, if you can. Sorry about the mess, hopefully everything works out smoothly for you. 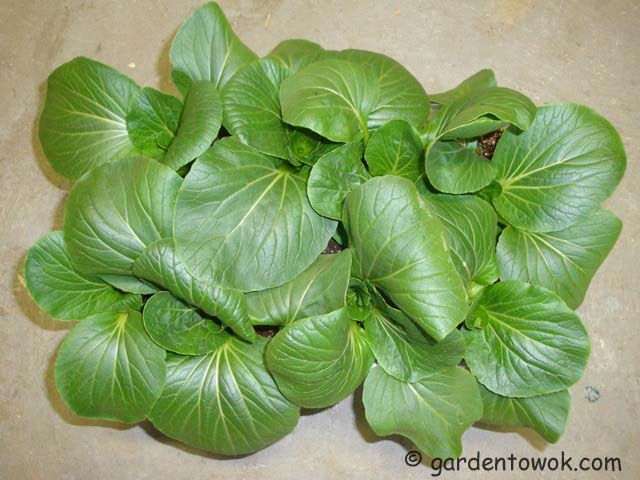 The bok choy looks beautiful! Norma, I feel your pain! We have suffered damage to our kitchen too from rain. I still get very stressed when it rains hard even though I know the problem has been fixed, although we still have a problem in our bedroom. We are desperately trying to find where the source of the problem is. Have a super day and there is light at the end of the tunnel. Your kitchen will be great once you have is sorted. Good luck with the insurance adjuster and repairs! Sounds like a lot of work needs to be done! Good luck! And hey! Your bok choy looks so fresh!! Never seen one that fresh before! Norma, sending good thoughts your way for a thaw and a speedy fix for the leak problem! I’m so sorry to hear of the troubles all the snow has caused you. We have had to have our roof shoveled this winter. Hopefully the snows that are predicted this week won’t be too much. If there is any good news in all this, hopefully you will be covered by insurance and get a lovely new kitchen. Good luck, I will be thinking about you and look forward to when you will be able to post again. Hi! I’m an italian blogger! I’m a cook! I follow yours! it’s very nice! Hi Norma! Just wanted you to know that you are missed! Hope the renovations are going well!